‘Iolani School, a top-ranked American college preparatory school, welcomes students from around the world to learn more about the extraordinary experience of an ‘Iolani education and the school’s newly launched boarding programs. With a legacy of excellence in academics, the arts, and athletics, ‘Iolani’s unique school culture empowers students with personal responsibility, work ethic, and intellectual humility. At the heart of this is the school’s “One Team” philosophy that reinforces a spirit of teamwork as the path to success. ‘Iolani has come a long way since its beginnings as a boarding and day school for boys founded during Hawaii’s monarchy days. Today, the school is a culturally diverse, co-educational college prep school for kindergarten to twelfth grade with approximately 1,900 day students and a capacity to have 112 boarding students who excel in diverse disciplines including science, economics, robotics, the visual and performing arts, sports, and more. More than 115 students in the past five years were named National Merit-semifinalists. Academic teams annually attend national championships in the sciences and humanities. For the past two years, ‘Iolani’s Science Olympiad team has finished first among all private schools and its mathematics team is ranked in the top 10 nationally with a 26-year league championship streak. The school’s top orchestra has won five national championships in the past five years and has performed at Carnegie Hall. The jazz band was recently featured at Kennedy Center in Washington, D.C.. Located in the center of ‘Iolani’s 25-acre urban campus, a new five-story dormitory has a capacity to accommodate 112 students in Grades 9–12. Students are separated by age and gender and each group is supported by a house team of caring and qualified faculty and staff. 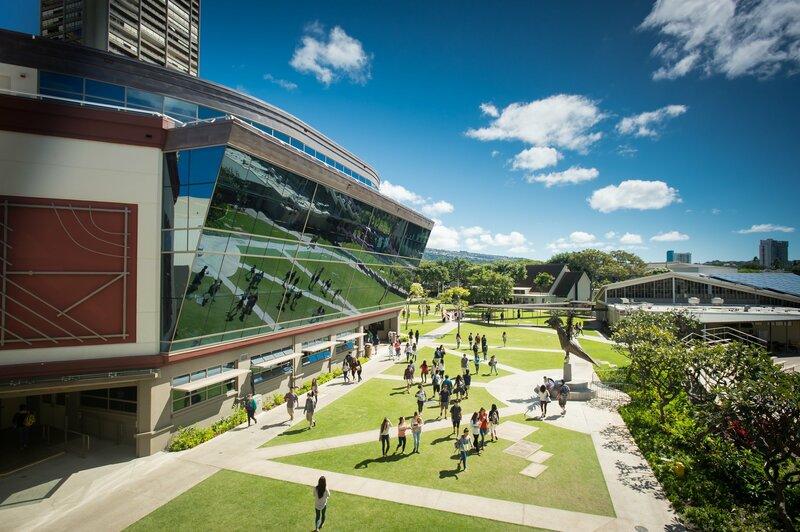 The program provides a globally connected experience for all `Iolani students. In addition, boarding students from the neighbor islands, the U.S. mainland, and abroad experience life in Honolulu through field trips, excursions, and learning more about Hawaiian culture including visits to museums, cultural events, and iconic destinations. In addition, during the summer, ‘Iolani is offering new residential programs for students entering grades 7 - 9. The programs include excursions and courses sure to be fulfilling and memorable. With the goal of preparing students for success in a changing world, ‘Iolani’s Sullivan Center for Innovation and Leadership focuses on 21st-century skills. Recognized as a world leader in innovation education, the space includes fabrication and design labs, collaborative work centers, research labs, flexible project spaces, and digital media centers. More than 25 project-based courses in which students address authentic real-world problems are electives within `Iolani’s Upper School course offerings. The school’s gymnasium is filled with banners for championships won in tennis, golf, swimming, basketball, football, track, bowling and more. The athletic facilities include a football field and track, baseball field, soccer field, Olympic-sized swimming pool, tennis courts, two gymnasiums, judo and wrestling rooms, and weight and training rooms. The full range of ‘Iolani experiences prepares students for the changing world that awaits them, with 100 percent of students accepted into 4-year colleges, including Boston University, Harvard University, New York University, Stanford University, the University of Washington, and Pomona College. ‘Iolani’s legacy of excellence includes contemporary alumni such as Apple Evangelist Guy Kawasaki, Musical Artist Angela Aki, Toronto Raptors General Manager Bobby Webster, and Disney’s Moana writers Aaron and Jordan Kandell. Many alumni return to campus as guest speakers and as mentors to students. ‘Iolani welcomes families to learn more about how the “One Team” culture embraces students from around the world so that they may pursue their passions and make a positive difference.